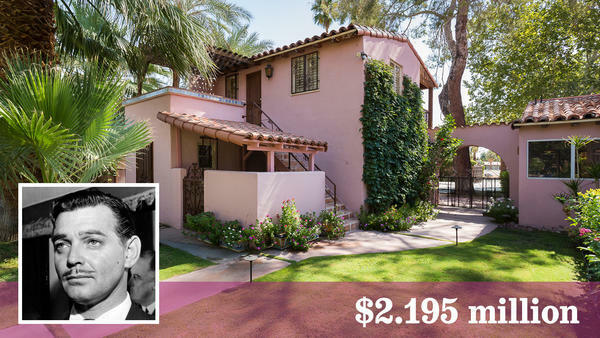 The Los Angeles Times is reporting that the former estate of Clark Gable and Carole Lombard in the historic Old Las Palmas area of Palm Springs is for sale at $2.195 million. The seller is film producer Joel Douglas, brother of Michael Douglas, and the son of Kirk Douglas. Built in 1925, the gated Spanish Colonial sits on more than a half-acre of grounds with a tree-lined circular drive, a pool house and swimming pool and a detached guesthouse and garage. Mature trees and lawn complete the grounds. The restored pink-stucco house has a den / office, four bedrooms, six bathrooms, family and living room fireplaces, and 3,301 square feet of living space. Period details include decorative wrought-iron work, vaulted beamed ceilings and colorful tile accents. The property is offered furnished, and includes a pool table custom made for Kirk Douglas, who turns 98 in December. Joel Douglas has worked on such films as One Flew Over the Cuckoo’s Nest, Romancing the Stone, and It Runs in the Family, which starred his father and brother. Comic actress Lombard, who died in a 1942 plane crash at 33, appeared in several movies with Gable, including No Man of Her Own, and In Name Only. Gregg Fletcher and Dean Sipe of Fletcher Sipe Group/HOM Sotheby’s International Realty are the listing agents. This entry was posted on Thursday, October 2nd, 2014 at 9:36 pm	and is filed under Blog by Manny Pacheco. You can follow any comments to this post through the RSS 2.0 feed. Responses are currently closed, but you can trackback from your own site.